Pocket Hide And Seek – Phonics: Beginning Sounds is a fun new game that kids LOVE to play. Take a moment for me to show you more about how this game works. It’s fast to put together, has a unique game-play and kids will beg to play it over and over! How Does Pocket Hide And Seek Work? First, you assemble the pockets. They are simple to cut out and fast to assemble with either glue or double stick tape. Then you cut out a puzzle and hide the pieces into some random pockets. I usually hold all the pockets together and slip them in so even I don’t know where they are! Lay out all the pockets on a flat surface so their face up. Kids point to a pocket and answer the question. In this case they have to correctly say what letter the picture clue starts with. If they answer correctly, they get to pick up the pocket and check to see if it holds a puzzle piece. If it does, they get to put that piece in the puzzle. FUN! It probably sounds more complicated than it really is… Once you play it once you’ll get the hang of it and you’ll want to keep playing over and over! 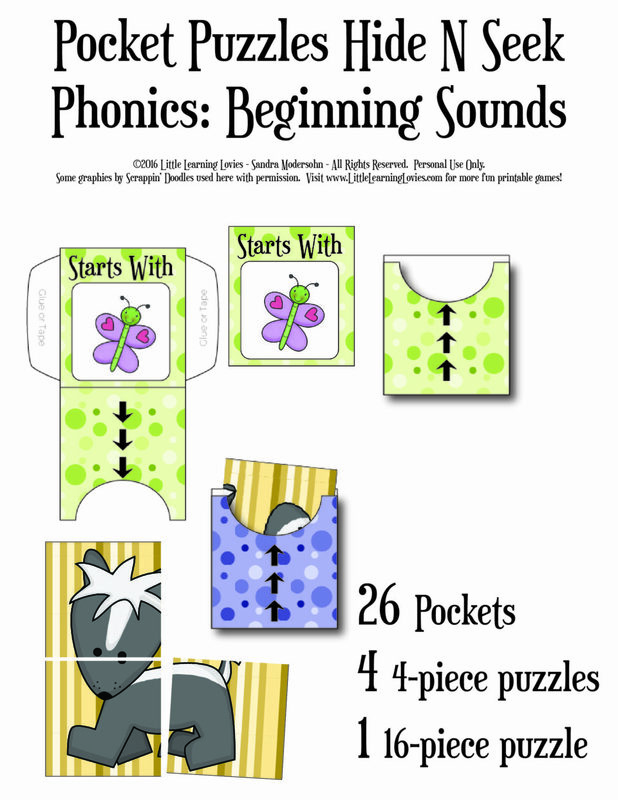 Kids too old for phonics? They’ll still love to play this game style. Try out our multiplication version!